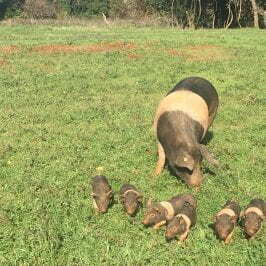 On September 1st, 2016, I sat at a long dinner table at Fattoria San Donato, a family run vineyard/”agriturismo” on the rural outskirts of San Gimignano, Italy, rapidly bouncing my leg up and down while playing Titus Andronicus loudly in my head, as I often do when I feel anxious. 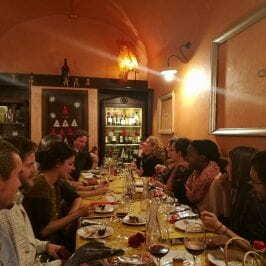 It was my first dinner with the people with whom I was about to spend the next semester: six American students and three Greek students, as well as a number of the Siena School for Liberal Arts’ sparse faculty. A poor night’s sleep at a Florentine hostel plus the anticipation of the social performance that was about to take place plus being in a new place with new people, divided by a few glasses of complimentary chianti, nonetheless made for a Brian who was trying to transcend his present state of inner agitation. As someone who deals frequently with mild to moderate anxiety, this was not an unfamiliar feeling to me. I turned up the loud punk music in my head to drown out what Jonathan Franzen describes as an alarm bell–“one of those big cast-iron dishes with an electric clapper that send schoolchildren into the street in fire drills”–constantly ringing, to the point that it loses any meaning and can often go unnoticed. My goal was to unnotice it, and I hoped that the eventualities of a bountiful four-course dinner and stimulating conversation with my new peers would accomplish this. But what really relegated my alarm bell to a faint background whisper was something else Spencer said, that it was refreshing to feel the same sort of butterflies when he left home this time as he did when he left for his freshman year. He appreciated, but most of all, acknowledged, the challenge of pushing his comfort zone and feeling nervous for something new, and the table wholeheartedly agreed. I felt silly for thinking, as I so often do, that I was the only one who could hear the alarm bell. Everyone hears it in their own way, but hears it nonetheless. I had to stop and pat myself on the back. I had just spent the last month flying and catching trains around Europe, from Athens to Thessaloniki, Budapest, Ljubljana, Bled, Prague, Florence, now San Gimignano, and finally, to Siena. It was the second time I had travelled alone, and the first time I had left the United States. I had heaven-sent training wheels in the form of a dear friend in Greece, but after that I was all on my lonesome. As someone grown accustomed to the hypersocial environment of a small college campus, I had no idea how I might handle being alone, in countries where I didn’t speak the local language, left to navigate a complex web of planes, trains, and hostel reservations. At the end of these weeks, I had a new normal: arrive in a city, get to my hostel, spend a few minutes searching and weighing dinner options for an optimal balance between taste, price, and proximity; then spend the next day walking around, getting a sense of direction, and usually going to the highest point in the city in order to orient myself. The following days would be spent mapping out recommended restaurants, museums, parks, sights, and more, and perhaps getting to know my fellow travelers. I loosened my death grip on my wallet, which had been raised not to consider travel a valid expense. I certainly wouldn’t trade any of the experiences I’ve had over the last month, but I’ve got a throbbing, hemorrhaging hole in my front left pocket. Having gotten comfortable in this routine, counting on no one for company but a backpack full of books, a moleskine, a mason jar (RIP) and a camera, I figured (correctly) that it would be a bit of a transition back into the world of interacting with people. 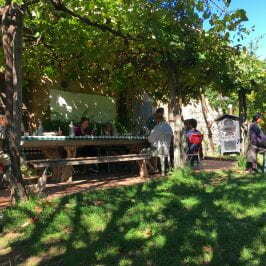 After day two at San Donato, which consisted of the beginning of orientation, paperwork, another wine tasting, and more incredible meals, my head was spinning from processing more spoken words than I’d heard in weeks. I was exhausted, sated, excited, nervous, happy, and proud of myself for coming this far, a mix that really is rather similar to freshman year. But I guess I would be remiss if I said nothing about Italy itself–the point of the above paragraphs is mostly to emphasize how much of travel is in your head, especially when you’re not accompanied by familiar faces. This was one of the biggest surprises to me. So: Italy. I’ve generally been impressed. Tuscany is beautiful, and I can tell the people who call it home have a certain pride in it, but the kind of pride that wants to share its subject. One of our hosts at San Donato insisted on speaking slow Italian to us, so we could start to get a grip on the language, and invited us to a medieval festival in which she was participating in town the next day. Even at restaurants in Florence, before I met up with my program, I got the sense that the staff were cheering me on in my clumsy attempts at the language, albeit with varying degrees of patience (a marked departure from the mostly utilitarian, transactional English used in the service industry elsewhere in Europe). Another note: people look good here. You would think no Italian had ever rolled out of bed and not felt like building an aesthetic for their day. And Siena, specifically: Angelo, my host father (at 29, more of a flatmate), playfully debased Siena over our first dinner–that there’s nothing to do, only old people live here, etc. But he’s lived here his whole life, so I insisted it must be nice, right? To which he conceded. On Sunday we went to a pizza cookout hosted by his contrada, the Contrada della Chiocciola. The city of Siena is divided into 17 contrade, or neighborhoods, that each have an animal mascot and a distinct local identity, with each contrada competing in the city’s annual palio, or horse race. Angelo’s neighborhood is represented by the snail, a figure which adorns doorways, sidewalks, mantlepieces, and t-shirts throughout the contrada. 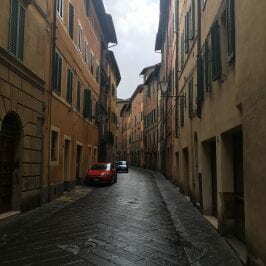 Siena is most famous for its palio, running nearly uninterrupted since medieval times, and for its robust contrada system, in which loyalty and a sense of community are created year-round through events like the pizza night I attended. I think I’ll like Siena, if it does seem a bit quiet now. I was never much of a city person anyway, and I’m reassured that I’m not missing out on much based on the interactions with (loud, drunk) American students I had in Prague and Florence. I think my next big challenge will be meeting people when not in a space that’s specifically designed to facilitate such encounters, like a college dorm or a hostel. I like my eight peers, my hosts, and the SSLA faculty, but that’s a pretty small circle for a social butterfly such as myself, and I’ve already swiped my way through everyone within a reasonable distance on Tinder (though the city’s university hasn’t repopulated yet). Will I continue to exercise the comfort in being alone I built up over the last few weeks, or figure out how to meet people in a language I barely speak? Stay tuned, folks. With your moleskine and mason jar, you’re all set to let all those loud, drunk Americans know just how lame and mainstream they are! Good luck on Tinder, Brian!